This week six very special Christmas cards will be sent from Ysgol Gymraeg to our partner schools all over Europe. As part of our Comenius project, ‘The Good Life’, we will send cards to the schools in Finland, Denmark, Turkey, The Republic of Ireland, Italy and Ysgol Llwyn yr Eos here in Wales. The cards feature one design from each year chosen from the hundreds of cards originally designed for the Year 6 Christmas Cards Scheme. It has also been very exciting to receive the lovely cards which have started arriving from our friends in Europe. On Monday we had the pleasure to welcome back a former pupil to the school to talk about her footballing career. Alice Evans is the Welsh ladies goal keeper. She has won many caps representing Wales. Good luck next year in the qualifying rounds for the World Cup. Many congratulations to one of our Year 5 pupils on winning a place in the British Orchestra. Soffia, who has played the fiddle since she was seven, attended an audition at the Arts Centre where she has to play two pieces in front of a panel. Soffia was delighted when she received a letter stating she was to be a substitute member of the orchestra, and that she could go to Weston-Super-Mare every month to practice with the orchestra. Soffia is pictured with her teacher Mrs McGuinness. Congratulations to them both. The Great Hall was once again full for the school's Christmas concert. The Foundation Phase performed a story about making a new cradle for Baby Jesus. 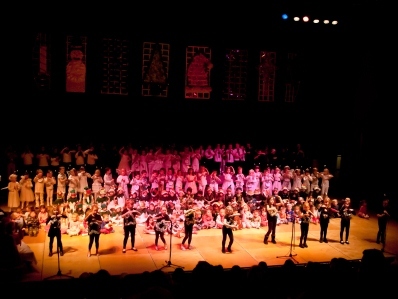 Well done children, everybody sang and recited excellently, and everyone looked very smart in their colourful costumes. Key Stage 2 performed a show about a group of mischievous angels who come down to Earth to help spread the good news about the birth of Christ. They were helped by the finalists of Fferm Ffactor, the homeless, 'Strictly' dancers and of course the important policemen. They managed to avoid Herod and his mean bouncers! Well done all on your excellent performances. Congratulations to the girls who represented the school in the Urdd Gymnsatics recently. The Ceredigion county round was held at Plascrug Leisure Centre, with the girls competing individually, in pais, trios and as a team. Over the weekend Wales played their final game of rugby during the Autumn series against Australia. 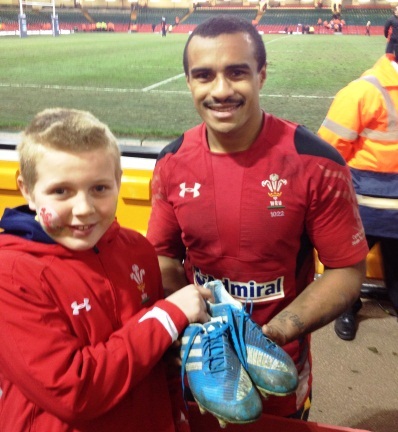 Unfortunately Wales lost but there was one Welsh supporter smiling at the end of the match when Australian Scrum-half Will Genia walked over to have a chat and give his boots in which he'd been playing the Autumn series to Iestyn Llŷr! We hope your feet will grow quickly so that you can wear them before long Iestyn!